- Smilie Face feature added to convert to smiley images. - Default table background color changed from gray to white. - System dynamically breaks guestbook entries into pages. - You can choose how many guestbook entries per page you would like to view. - Some display formatting was done on the file add.php to allow better viewing of results. -Your Name entered will now have to be 40 or less characters. -Your Email entered will now have to be 40 or less characters. for the scrip to add the entry to the guestbook. - Email notification of administator was added. - Option added for making Email, Name and/or Message optional. - All configuration adjustments can now be made from config.php file. - All functions moved to the "functions.php" file for easier inclusion. Provides additional security by not allowing visitors to access the guestbook directory. - GNU License was added to the script in order to make this code officially open source. - Bad word filter was added to the guestbook system. - Messsage flooding prevention was added to the system. - German Language file translation corrected. - Guestbook Entries are now stored as OBJECTS into the text file (Pete). - New Administrative Interface Allows Admin to Delete Guestbook Entries Safely (Pete). - Some bug fixes on the code thanks to Mike (mr pain) and Robbert (Thank you both). - New Search Feature Added, which allows searching by any entry field (Thanks Mike). - Language File generator form now allows admin to create their own wording for language. - Option added to log visitor IP and Spammer IP Number and address. - Ban option added based on visitor's IP Number. - Spam block feature added based on keyword specified by admin in config.php file. - Added Optional Image Verification Feature using GD library to avoid spam. hi, pete, i agree with you and thanks very much for your infomation. footer.php - Removed the version of the Guestbook from this file to make it more difficult for hackers to identify the guestbook version. sanitize.php - Adds additional data sanitization functions to prevent XSS and script injection and remove special characters. search.php - Added additional data sanitation check to this file and fixed the paging issue. Note - For upgrade instructions from previous version 1.7.2 to 1.7.3 please read THIS thread. Last edit: 5 years 6 months ago by cacamoto. You can post a new thread in the PHP Forum with a detailed description of the issue. Alternatively if this is a private issue, you can PM me directly with your issue. Last edit: 5 years 6 months ago by Pete. 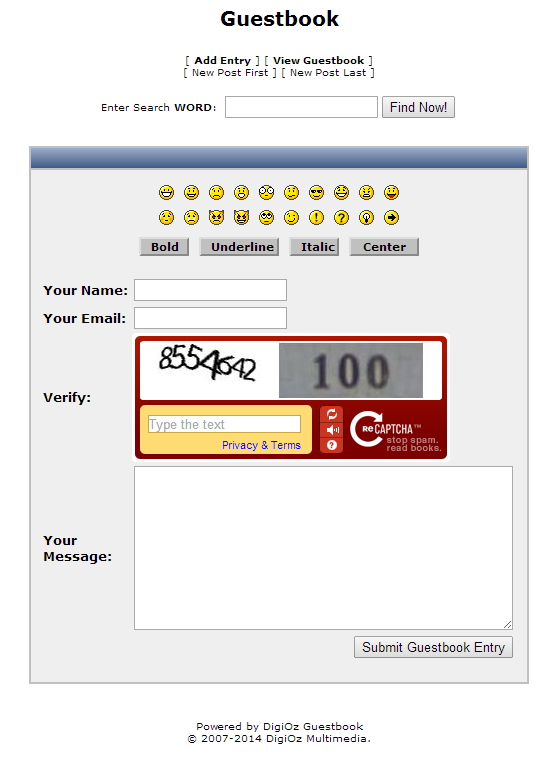 - Added support to Recaptcha Image Verification in addition to the simple image verification that was available previously. You can now in config.php set the "image_verify" variable to 1 to get the simple version or 2 to get the Recaptcha version. If you chose 2, you will need to register at google.com/recaptcha and obtain a public and private key string from them, and enter it in the appropriate section in config.php. - Changed the Copyright Year range to automatically increment the year as it changes. - Removed the left over version text from the title. Last edit: 5 years 1 month ago by Pete. The DigiOz Open Source Team is proud to present the DigiOz Guestbook Version 2.0.0. - Changed the Guestbook Theme to a new Theme submitted by Paul Williamson (thanks Paul). The old theme is still in the guestbook and can be switched to by setting the theme variable to "simple" in the config.php file. - Move the following files to the new "includes" folder: config.php, gbclass.php (now gb.class.php), random.php, sanitize.php. - Removed the header.php and footer.php files. The header and footer are now controlled by the "themes/default/header.html" and "themes/default/footer.html" files. - The number of entries shown on the Guestbook List can now be controlled from config.php. - Completely new Pagination System, which only shows a maximum of 7 pages at a time, and slides forward and back based on the current page. We also added a first and last page button, along with the forward and backwards buttons. - Completely new look for the Administrative Area. - Updated the Dutch, German, Greek, Philippino and Swedish Language files to include system messages in the proper language. - Added a Persian Language File to the list. - Added blank index.html files to various directories to prevent listing of content of the directories. Renamed the guestbook Class file "gb.class.php" from "gbclass.php" in order to be consistant with the syntax used for other class files. You can now download this version from HERE , or see the Demo HERE . Last edit: 1 year 9 months ago by Pete. - Default Theme Gradient Stylesheet Bug fix for Internet Explorer, which prevented the background of message boxes to show a gradient for the default theme. - Changed the shorthand "<?" PHP open tag notation to "<?php" which is the standard notation in order to avoid issues with the sanitize.php file not parsing on some web servers that do not support the shorthand notation. - Added Google reCaptcha Version 2.0 Support in addition to the previous reCaptcha Version 1.0 support and our in house image verification support. Please note that in order for you to use the new reCaptcha Version 2.0, you will have to obtain a brand new public and private key from Google as the old reCaptcha keys will no longer work with the new version of reCaptcha. - Update your guestbook "$gb_version" parameter in the "includes/config.php" file from "2.0.1" to "2.0.2". - Open the "includes/config.php" file up, and change the "$image_verify" value to "3". - Get a new public and private key pair from google.com/recaptcha. If you had a previous Version 1.0 key, remove them and replace your new ones under "$recaptcha_public_key" and "$recaptcha_private_key". If you didn't have an older key, get a new key and add them to the two above variables. Last edit: 4 years 3 months ago by Pete.